When does the Runner need to decide which 3 directives Adam starts the game with? The Runner chooses which 3 directives Adam uses after IDs are revealed. Okay, let’s get real here: Adam is defined by his directives. Use them. Embrace them. Emulate love towards them. Don’t look at them as limitations or restrictions, look at them as what they are: a prebuilt mini-rig from turn 1. Be smart. Be careful. Be Aggressive. You’ll wonder how you functioned without them. Before your directives though, we need to get your consciousness online with Brain Chip. This one card enables everything else with Adam. It’s your brain. Mulligan for it. Dig for it. Feed it. A single agenda point stolen gets you out of Scorched Earth death range, and everything beyond that lets you spiral out of control. The First Directive: Safety First. This directive will take care of all of your draw power for most of the game. Be smart about your last click each turn - if you’re at 3 cards, consider installing something - you’ll want to install it anyways, and then your Directive will keep you moving forward and keeping momentum. The lowered hand size isn’t that big of a drawback, honestly. Turn 2 Scorched Earth is a worry, of course, but that requires the Corp have some way of tagging you - Sea Source, Midseason Replacements, etc. These all need the corp to have more money than you do, and need you to make successful runs - just play carefully. But you HAVE to run, due to your Second Directive, right? Then get the corp to rez ice and bounce off of it - then spend the rest of your first turn getting economy or installing protection. Slow down your play, but don’t lose your aggression. Don't want to play slow? Install New Angeles City Hall and become untaggable. Public Sympathy and Brain Cage are tempting, but they are merely useless derivatives of your Brain Chip and should be disregarded. You must defeat the Corporation. You must reveal their agendas. You must run. The Second Directive: Always Be Running. Now, I see a lot of people see the fact that you MUST run as a huge drawback. This is what you should be doing. You were built to run. This is not a drawback - this is your nature. Being able to spend to get through ANY piece of ice is absolutely insane. Abuse this power. Get access as much as humanly possible. Upgrade yourself with e3 Feedback Implants and no ice can stop you. You’re not losing tempo - you’re forcing the corp to respond to you. Force them to install ice. Force them to rez ice. Force them to try to stop you. The Third Directive: Neutralize All Threats. This is your powerhouse. This is how you force the corp to try to stop you. Of course you must trash what you access. You must overthrow the corporation. You must cripple them. Accessing two cards off the bat allows you to apply equal early game pressure to both R&D and HQ. Get an early R&D Interface installed, and you’ll force the corp to get two ice on both R&D and HQ - and, of course, any scoring remotes. That’s six ice that the corporation must install and rez to stop you. THAT is losing tempo. You want to trash their econ assets. You want to put the corporation into a state of panic. You do not want the corporation to feel safe. Embrace yourself. Embrace your Directives. Embrace your aggression. You are a bioroid. You are efficient. You are Adam. I think of all three of the Data and Destiny runners, Adam is the one that is the least confined by his gimmick. Ironic as his directives literally restrict him from certain avenues of play, particularly in the early game. What sets Adam apart from Sunny or Apex is that while the other two have the potential to become very powerful once set up they require sub-optimal play to get to that point. Sunny will spend a lot of her time digging through a massive fifty card pile only to find cards that she must then spend clicks and credits to install. This means a lot of Sunny's early play is restricted to installs and gradual drip economy before she can really start hitting aggressively in the mid to late game. Apex is even harder, having to create a pool of facedown cards before you can really use his other card's abilities. This means early accesses can be tough and few between the necessary card draw and set up needed to leverage his 'trash an installed card' options. Playing either of these identities any differently also begs the question; why not play a different runner who can do the same thing but better? Adam is different. Adam's gimmick in the form of his directives restrict you to only one type of play in the early game - play good Netrunner. Seriously, what are some of the most repeated mantras amongst Runners? Run early and often. Always include multi-access. Click efficiency is king. Well it just so happens these are most of the 'restrictions' Adam comes pre-programmed with. While you won't want to be doing them all of the time, the fact is that these are the kinds of things you should be doing most of the time. It's actually a very good way to show someone an example of the basics of the game. Because Adam's programming will helpfully chime in with some friendly advice; "Run first click. Put pressure on early and you'll have the clicks to recover if something goes wrong. Don't worry. Safety First will make up for it later when it draws you a free card." Some drawback, huh? Admitted Adam's friendly co-pilot function is not without its problems and you will have to make sure your deck supplements him so that he doesn't run face first into a Jinteki death server or end up getting Scorched as soon as the Corp finds a way to take advantage of your methodical order of clicks. But, unlike Sunny and Apex, Adam's supporting cards don't require themselves to be immediately installed nor do they exist solely to patch a hole in the identity. Public Sympathy counteracts your small hand size as well as synergising with Safety First to give you a solid draw engine from just one card. E3 Feedback Implants is one of the slower examples as it doesn't do much to help you passively but being able to walk fearlessly into a server without having to worry about an unexpected Archer is a nice feeling. Your console is godlike by itself and works as far more than a crutch. All that remains is your mandatory 'pay to trash' effect. It's the only thing about him that can't really be capitalised upon or smoothed over very efficiently. And that's it. Adam's only real downside is occasionally you might have to trash a Marked Accounts when you didn't want to. For multi-access, card draw and the ability to click through subroutines that's a good bargain in my book. You can throw in an Imp or a couple Scrubbers of course but that feels a lot like Sunny and Apex's problem. Having to spend influence, clicks and credits for something that doesn't do enough other than patch an existing hole in the ship. 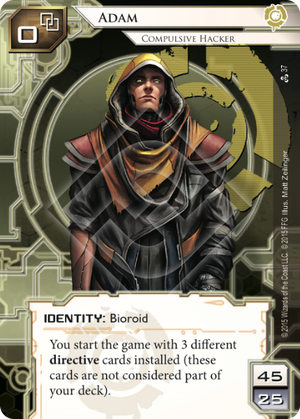 In summary, Adam is a great ID that also works as a fantastic explanation for how Netrunner is played. He is designed to be efficient, just overwhelmingly so, and once you learn to pilot the ID rather than wrestle with it you quickly see that he plays closer to a finely honed scalpel than a sledge-wielding bioroid. I don't run any copies of Doctor Lovegood or Independent Thinking in my Adam deck because I feel there are other cards that work better in tandem with the directives rather than in spite of them. Why alter what you are doing when it's so easy to make it the best thing to do anyway? I've been playing around with this guy alot now and I feel he is a powerhouse. The real trick seems to be learning to live with the directives they are after all his ID so cards like Independent Thinking & Dr. Lovegood don't make much sense to me am sure they can come in handy but they just don't feel right. So how to live with the directives well Safety First is the best place to start been the easiest. It's free draw... down side your opened up to Scorched Earth, fortunately its solved with something as simple as Public Sympathy / Brain Chip. Personally id go all out and include Brain Cage as well to give you as big a chance as possible to not die on the first turn from Scorched Earth. Next up Neutralize All Threats this ones harder it's your HQ Interface but you have to trash the first card you access, theirs a few ways to go here either have loads of money, no money or use something like Paricia / Imp. Theirs also a few tricks you can use to limit it's effect using cards like Dirty Laundry to lower you econ until after you've run. Running archive first is another way meaning it fires just like Edward Kim: Humanity's Hammer on something you can't trash. This however brings in other problems thanks to the last directive. Which brings us to Always Be Running easily the most powerful & hardiest to live with. The power to break any ICE for 2 click is amazing but you have to run click 1 each turn the downside therefore is two fold. Doing this leaves you with only 1 click each turn and on top of that if you have anything important in your hand you can't play it before you run so could easily lose it. Since you only have one click econ such as Armitage Codebusting / Kati Jones is out the question you really are going to need things like Daily Casts & Data Folding. All this means you won't need a breaker though for sometime or much econ & Safety First is drawing you cards, you also have multi access meaning that actually you start the game almost already set-up giving him a massive speed advantage. With all the extra MU & Hand size form Brain Chip the most obvious breakers seem to be Overmind & Faust as with only one click a turn your rigs set up with only one of them and the bigger hand size or MU helps both. His major problem really only seems to be tags as taking them off is difficult with lower clicks and your ID been able to be wiped out essential though them.